Welcome! The 8th Annual tournament took place in September 2018 raising $23,500. We look forward to hosting another wonderful and high spirited event! Details for the 9th Annual T-Red Memorial Golf Classic are to be announced in early Spring 2019. 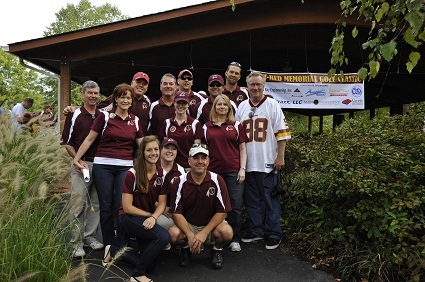 Since its inception, the T-Red Memorial Golf Classic has raised over $136,000. Our events benefit the Crohn’s and Colitis Foundation of America. We also fund a scholarship for business students at Salisbury University. The golf tournament is held in memory of Tommy Redmiles, a dear friend to so many. It’s a truly magical day when we all get together at the golf course in Tommy’s honor. The T-Red Classic is a day of fun, good people, good food and golf. The Foundation is made up fully by volunteers. The Thomas H. Redmiles Foundation is a 501(c)(3) non-profit foundation. All donations are fully tax deductible. Thank you to our sponsors, golfers, volunteers, dinner guests and silent auction winners.